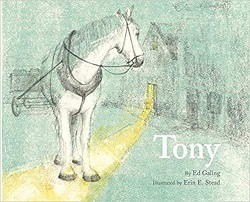 Viking Children’s Books, March 12, 2019. 290 pages. Review written February 1, 2019, from an advance reader copy picked up at ALA Midwinter Meeting. I read Laurie Halse Anderson’s novel Speak during library school, when I was taking a class on young adult literature (but wasn’t posting reviews because I was too busy). The novel, written twenty years ago, is already a classic. It features a girl who doesn’t speak because she’s traumatized by what happened to her at a party just before she began high school. 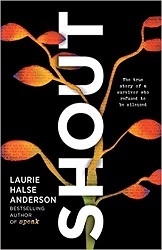 Now Laurie Halse Anderson is telling the true story of what happened to her. This memoir is written in verse, and the poems are hard-hitting. 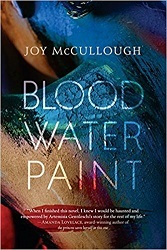 She gives an outline of her background and the incident that happened to her that was later reflected in the book Speak. But more than that, she includes in the book many stories that were told to her after she wrote Speak. Stories from teens both female and male, and stories from women and men. Here’s a bit from the poem “tsunami,” which is about the reaction from teens after Speak was published. She also writes about how much resistance there is to her books from teachers and principals, hoping if they keep her from talking about bad things, bad things won’t happen at their school. “No,” he said. “Not competitors. I also love the part where she describes the year she spent studying in a student exchange program with a family on a pig farm in Denmark. That was a time when it was good to be on a new continent. And I love the poem “yes, please” about how lovely it is to get a Yes. But the overall story is that the time to simply speak is done. Now it’s time to shout. This is a wonderful book. I’m passing on my advance reader copy, because I know I’ll want to read it again in the finished form. Watch for it in March. The poems stick with you and get into your heart. Roaring Brook Press, New York, 2016. 44 pages. Besides showing kids what concrete poems are, this book gets the reader looking at things in new ways. 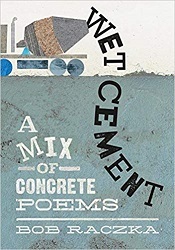 I love the title example of calling the book of concrete poems Wet Cement and having the words pictured coming out of a cement mixer. An example I can easily explain is his poem “Hopscotch.” In the title, the nine letters of “Hopscotch” go up the page in place as if in a hopscotch grid. On the next page, the twelve words of the poem go up the page in the same format. There’s lots of cleverness here. The poems are short and sweet and don’t look difficult. They’re at least not difficult to understand, but get you looking at the objects in new ways. 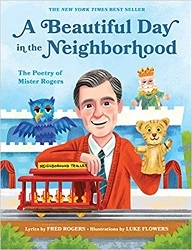 This book will definitely spur kids to try to create their own concrete poems. They may discover it’s harder than it looks! Wordsong (Highlights), Honesdale, Pennsylvania, 2015. 32 pages. 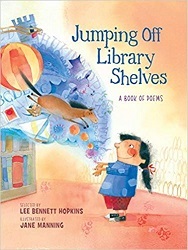 A book of poems about libraries! Yes, please! There are fifteen poems in this book, all by different authors except for Rebecca Kai Dotlich, who has the starting and ending poem. All the poems have something to do with libraries. I’m going to simply quote some of my favorite lines. It reached out and grabbed me! where a pig loves a spider. . . . 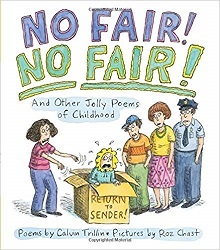 These poems are accessible for very young children as well as kids in school. And they celebrate libraries. What could be better? Everyman’s Library Pocket Poets, Alfred A. Knopf, New York, 2015. 256 pages. Measure for Measure is like a college course on poetic meter. You learn about the different metric forms and then hear examples.like a college course on poetic meter. You learn about the different metric forms and then experience them. 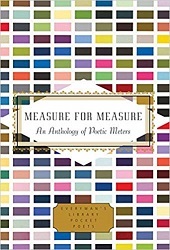 The book explains various types of poetic meter – and then is filled with examples. This is a book that should be read aloud! There’s a nice selection of classic poems I’d heard before combined with more modern ones. My one little complaint was that many examples were only excerpts from longer works, and I would have preferred the complete poem in most cases. But I have to say that this did keep the book short and manageable. The Everyman’s Library Pocket Poets come in a compact size, easily carried about, with a ribbon bookmark. My method was to read aloud the poems on one double-page spread each morning. Hearing the poems, I quickly got a feel for the different meters. Reading the names of the sections, you’ll understand that this book will teach you about new poetic forms. We’ve got: Accentual Poems, Trochaic Poems, Anapestic Poems, Dactylic Poems, Iambic Poems, Poems in Ballad Meter and Fourteeners, Amphibrachic Poems, Dipodic Poems, Poems in Sapphics and Alcaics, and Poems in Hendecasyllabics, Cretics, and Lesser Ionics. This charming little book is both instructive and entertaining. And a must-read for aspiring poets. National Geographic, 2017. 40 pages. At its heart, the Photo Ark was born out of necessity. I have been sent around the world by National Geographic magazine for more than 20 years to take photographs of people, places, and animals. There have been assignments to capture images of the fiercest predators, the shyest sea creatures, the most beautiful birds, and so many more. Several years ago, I started to see that people weren’t paying much attention to the fate of all the other species we share this planet with. Without action, and soon, I worried that many animals could go extinct. The Photo Ark is my answer to this. By introducing the entire world to thousands of photographs of mammals, birds, reptiles, amphibians, fish, and even insects, I hope we can get everyone following, liking, texting, tweeting, and even talking about this wondrous world of ours. In the Photo Ark, every creature is equal. I use simple black and white backgrounds, which make all animals appear to be the same size, no matter how large or small they might be in the wild. Each photo also shows you the amazing detail of a creature’s scales, skin, or feathers; their eyes, antennae, or legs – each creature with its own kind of stunning beauty. A slippery minnow in the Photo Ark appears as big as a shark, and a tiny tiger beetle as impressive as a mighty tiger. I want people around the world to look these animals in the eye, and then fall in love with creatures as dazzling as a pheasant or as odd as an octopus. And once we love something, won’t we do anything to save it? 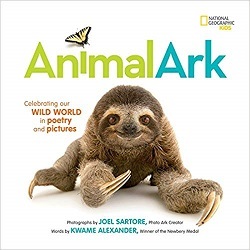 The highlight of this book is Joel Sartore’s stunning photographs of 32 of these creatures. But they’ve been paired with Kwame Alexander’s poetry to make a powerful picture book and bring these animals to young readers. The poet chose haiku as the form to create a potent message and create instant connection with the reader. I can’t emphasize enough how striking these images are against their black and white backgrounds. Of course, I got to hear Kwame Alexander perform some of these poems with the images flashed up on a screen. Unforgettable! This is a book you need to experience for yourself. Source: This review is based on a book I received at an ALA conference and had signed by the author. Chin Music Press, Seattle, 2016. 64 pages. As soon as you touch this book, you know it’s something special. You can feel the high-quality paper, which seems appropriate for a book of Japanese poems. This is a book of poetry from Japan’s most-loved children’s poet, but it’s also a biography and the story of uncovering Misuzu’s story. The book begins with Setsuo Yazaki, who read one of Misuzu’s poems and wanted to find out more about her. He was the one who uncovered her diaries and made public her life story, as well as many more unpublished poems. She is now widely read by children in Japan. Along with telling this story, on each spread one of her poems is given. Misuzu wrote a letter that night asking her husband to give Fusae to her mother. She was weak from the illness and determined not to let her husband take their child. So she decided to end her life. She was only twenty-six years old. The narrative part goes on to talk about how Misuzu’s poems were rediscovered after her death and went on to have special significance after the tsunami in 2011. The book finishes with a collection of 15 more poems by Misuzu, with the original Japanese shown as well. 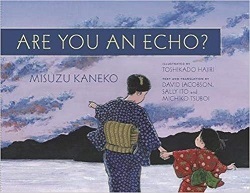 Despite Misuzu Kaneko’s tragic life story, this lovely book expresses hope, and shows the beauty of looking at the world with eyes of kindness and empathy. How can you help but like someone with this philosophy?